We're still months away from even seeing a trailer for Avengers: Infinity War, but we have some new promo art for the highly anticipated movie to peek at for now. 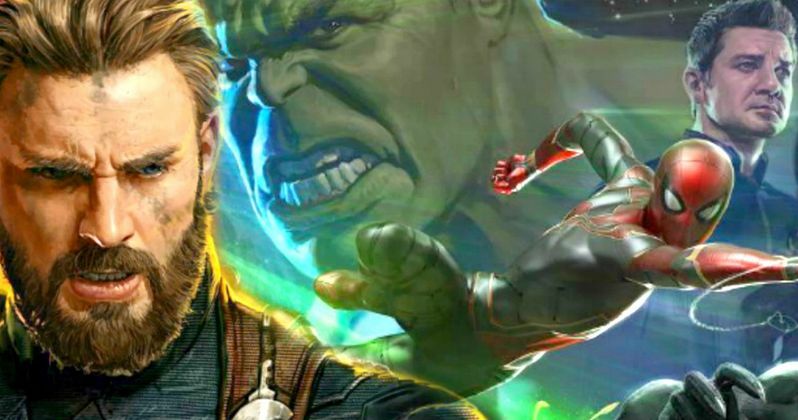 It appears that Disney and Marvel are about to begin the massive marketing campaign for Infinity War and Thor: Ragnarok as the release dates get closer and it looks like we're all in store for some pretty awesome stuff. The new art comes right after production officially started in Atlanta for Avengers 4 last week and after the much sought after D23 footage was shown to the lucky attendees of the expo. The new promotional artwork comes to us via About Tom Holland's Twitter account and while it does not feature all of the massive cast, it focuses 6 characters including Teenager Groot, Iron Man, Steve Rogers, Star-Lord, Spider-Man, and Rocket all looking very manly. The promo artwork was done by award-winning artist Steve Cas and is bound to include more as this specific piece only shows off a few members of Guardians of the Galaxy with Steve Rogers (who may or may not be Nomad) and Spider-Man. Spider-Man is seen showing off the Iron Spider suit that was gifted to him by Tony Stark at the end of Spider-Man: Homecoming. What's a little weird is that Steve Rogers does not seem to be wearing his black Nomad suit as previous artwork suggested. This could be intentional to not spoil anything before Infinity War hits theaters, but this is pure speculation at this point. It is also important to note that there are multiple versions of Cas' Avengers: Infinity War promotional art, so this might not be the finished version. One version has the team in front of the Avengers logo while another version looks close to the artwork of Jim Starlin's Infinity Gauntlet comic book series. Elsewhere in the promo art, Groot appears to be a grumpy teenager, annoyed that somebody is interrupting his gaming time and Star-Lord looks like he has a slightly different jacket. Rocket looks just as awesome as ever with a giant blaster held over his shoulder and looks like he should have a cigar dangling out of his mouth. Other than that, the Guardians of the Galaxy team looks relatively unchanged and ready to battle Thanos. As previously mentioned, there are different pictures of the art in progress and in one of the pictures it appears that Steve Cas could be working on t-shirt designs. If so, this Avengers: Infinity War promotional art might end up on a bunch of different products to promote the movie. This is all speculation at this point as we are still a ways off from even seeing the official trailer. The massive movie is going to be the huge beginning of the end for the Marvel universe as we know it and excitement is at an all time high, but we still have a ways to go before anything official comes down the line. In the meantime, you can check out the promotional artwork for Avengers: Infinity War below and keep an eye out for that trailer.